(Community Matters) It Pays to Have a Leader with the Nimbleness & Commitment to Innovation of an Entrepreneur: Reminds me of our best entrepreneurs – they’ll throw out a strawdog for comment and reply, then emerge with the best plan. About time we stir things up and try new ways in Austin, Tx. “I’ll be asking for three to five FTE’s [full-time equivalent employees] for rest of fiscal year that the City Manager says are available in the existing budget (at no additional new cost to taxpayers),” he texted. (Austin Monitor: Friday, Feb 20): After hearing strong opposition from his colleagues as well as others, Mayor Steve Adler is proposing a complete revamp of his plan for additional staffing in the Mayor’s office. 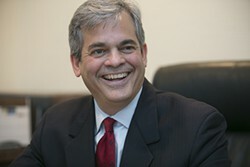 Adler told the Austin Monitor Thursday that he would be pulling down his proposal to fund additional staff for the Mayor’s office through the Better Austin Foundation. Adler said he expects to have a total of nine staff members. He currently has four on his staff plus Sara Hartley, who is on loan from the public information office. On Feb. 10, Adler proposed a total of 22 positions, including eight staff members, eight cabinet members and six foundation members. Many of those people would not have received a salary but a majority of Council members were troubled by the proposal. In particular, several of his colleagues expressed concern that the additional staff would mean too much power accumulating in the Mayor’s office. Even though Adler spoke at length in defense of foundation funding for his staff at the Feb. 12 Council meeting, his colleagues did not seem persuaded. For example, Council Member Ellen Troxclair said she was concerned that the new members of the Mayor’s staff would dilute the voice of the 10 Council members representing specific districts in the city. Mayor Pro Tem Kathie Tovo expressed similar concerns. Even Council Member Greg Casar, a cosponsor of the proposal, said the new staff should work on a project by project basis. And Council Member Don Zimmerman said the city should simply identify eight city positions for the Mayor’s office. Adler said Thursday that the new proposal would be posted on the Council bulletin board and would be “available to be discussed on Tuesday,” at the Council work session. “We’re trying to listen to the comments that people make and hear their concerns,” he said. Although the staffing item is currently on the draft agenda for next Thursday, Adler said he was not sure whether Council would actually take up the item then. “It seems as if most people would rather see it done without the foundation,” he said. Later, Adler told the Monitor via text that he was not ready to name which specific people would become city employees of those he had originally named to serve on his staff. However, he said that neither his wife, Diane Land, nor Mark Yznaga, Council Member Ann Kitchen’s husband, would be among those hired. Land was not slated to receive a salary from the foundation but Yznaga was. In addition, Adler said he plans to ask the city manager for $250,000, which he believes is available to fund $25,000 each for the 10 district offices. He said that would be for “enhanced district constituent work (or as otherwise designated by each member for their office). And I’ll ask Audit and Finance committee to look at funding Council and mayor offices for long term as part of this year’s budget process,” he wrote. ” This office will continue to be nimble in pursuit of supporting the 10-1 system addressing our city’s big challenges,” he concluded.